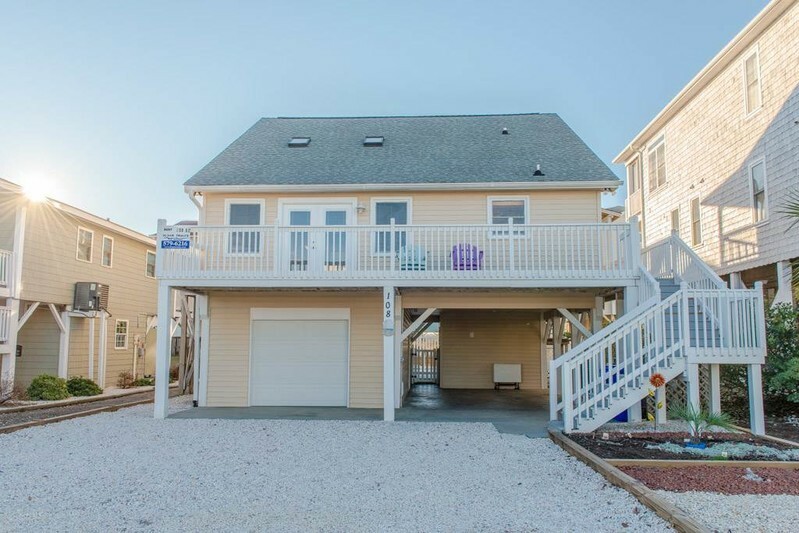 Well maintained 5BR, 2 BA, beach house with a private pool: CCTV, DVD/Surround Sound Stereo System, Wifi. Three Porches (2 covered) with rockers and swings. For added convenience there is a Hot/Cold outside privacy shower, gas grill. Partial ocean view from top floor master bedroom and deck. Fully equipped kitchen with large inviting table and seating at the kitchen bar to gather the family for meals and games. Dishwasher, Microwave. Washer/Dryer. Non-smoking. Sleeps 12 Bedding : 1st Floor: Queen, Queen, 2nd Floor: 2 Bunk beds, King, Single w/ trundle in small loft room. House was perfect and exceeded all my expectations. My family and I had a wonderful time. House accommodated 12 of us (4 kids) with plenty of room. Kitchen was stocked with cooking supplies and garage stocked with pool toys and beach gear. Very clean home with linens and plenty of towels for all. Even the small details were taken care of like labeling of light switches and directions for tv use were great. I would definitely recommend this home to anyone and would use for a future vacation.